Not a great day weather-wise; from my window I could see cloudy grey sky and more than a breeze blowing through the trees. But I hadn’t been out for a proper walk for a while and after a wonderful but hectic family Festive Season I needed fresh air and exercise. And I had a fitness-monitoring, step-counting watch gizmo as a Christmas present that I was keen to try out. 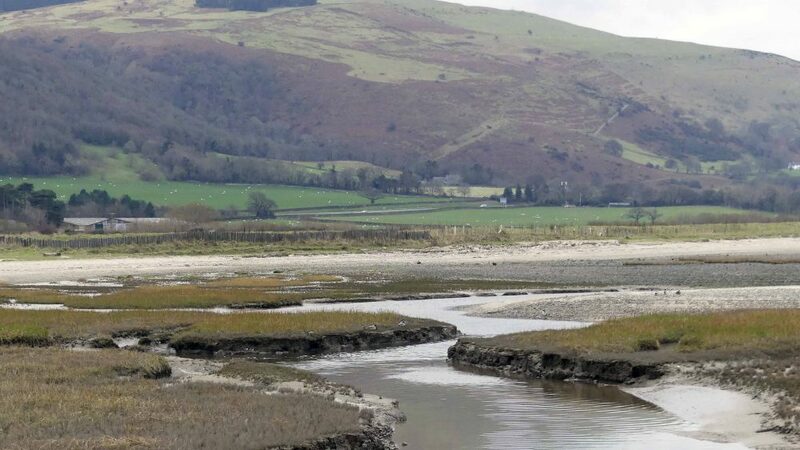 Sticking to my resolve to improve my duck recognition skills and knowledge I decided to go back to Llanfairfechan, which would be sure to fulfil the exercise and fresh air part and would hopefully have birds too. 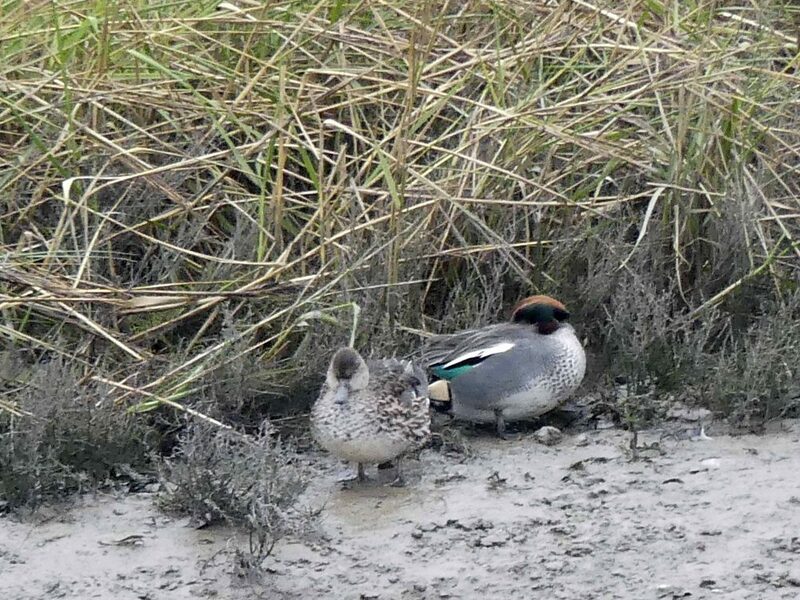 My target ducks for the day were to be Teal and I was hoping to improve on the photographs I took at RSPB Conwy a few days ago. 13:20 The car temperature gauge read 7°, and minded by Alfred Wainwright’s famous quote, I’d put on extra layers in anticipation of the cold, but a stiff breeze made the air that greeted me in the almost-deserted car park feel bitter: and worse, the café was closed! So no tea to thaw out with when I got back. 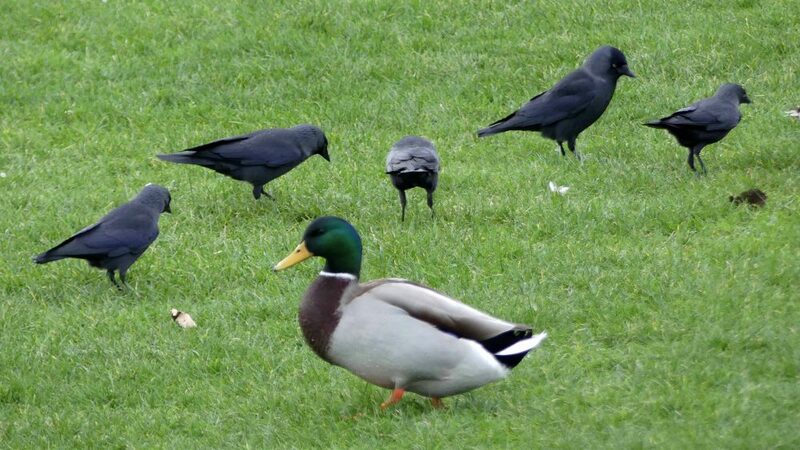 For birds though, it has to be business as usual or starve, so there were the usual Mallards on the river and a few more on the grass; they and the Jackdaws were looking rather disappointed by the lack of human-donated titbits. 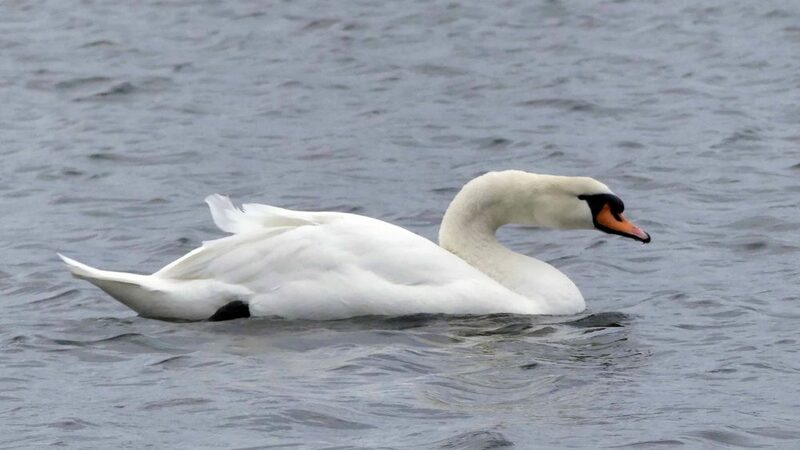 13:21 The Swan family was out sailing on the wind-rippled model boating lake. 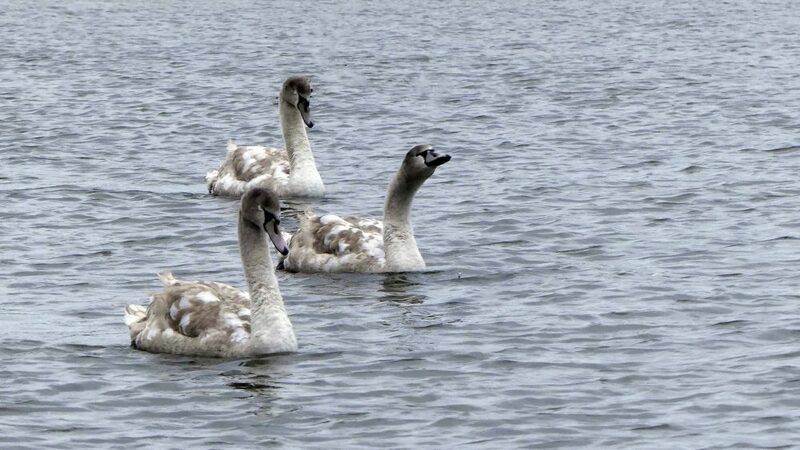 The cygnets, if you can still call them that when almost fully-grown, are definitely no longer Ugly Ducklings, they have the size and grace of the adults and are turning white to differing degrees, which I guess must relate to the order they hatched in. They too are used to having food thrown to them by visitors and travelled towards me hopefully. I had nothing to offer even though they posed nicely for photographs. 13:28 It felt cold there, but out from the shelter of the trees at the side of the lake the effects of the wind blowing into my face, it got worse. I met a few hardy souls making their way back, mostly dog walkers braving the elements for the love of their pets, but I almost had the place to myself. 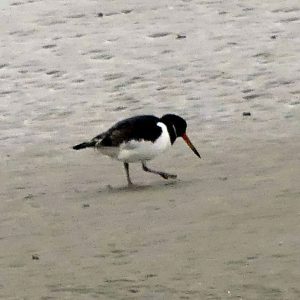 1330: The tide was out but there were a few waders out on the sand close enough to see; a Black-headed gull, an Oystercatcher and a Redshank. 13:41 I reached the corner where the stand of trees gave a smidgen of shelter from the icy blast and stopped for a couple of minutes to look at the pine trees. They are very exposed to the elements here, but in the main they stand straight and tall and look to be a good age. 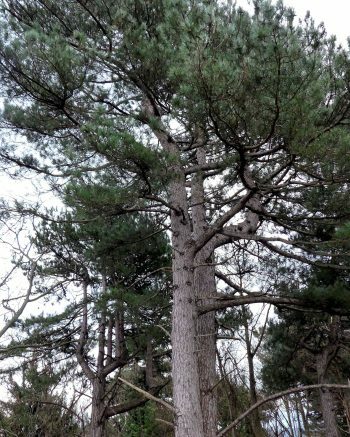 I think they are Monterey Pines – Pinus radiata, an introduced species originating from California that is probably the most widely planted tree in the world. It is characterised by having branches that radiate out from its trunk, hence radiata. The trees often has conspicuous cones that may fall or that sometimes remain on the tree for years. I must look for cones another day. 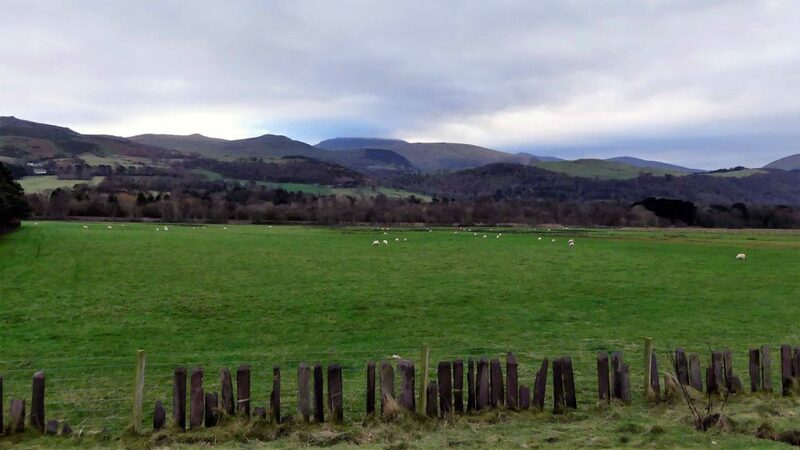 13:44 As always, the view over the slate-fenced green field dotted with sheep, with the hills and mountains beyond was beautiful, even on a dull cloudy day like today. 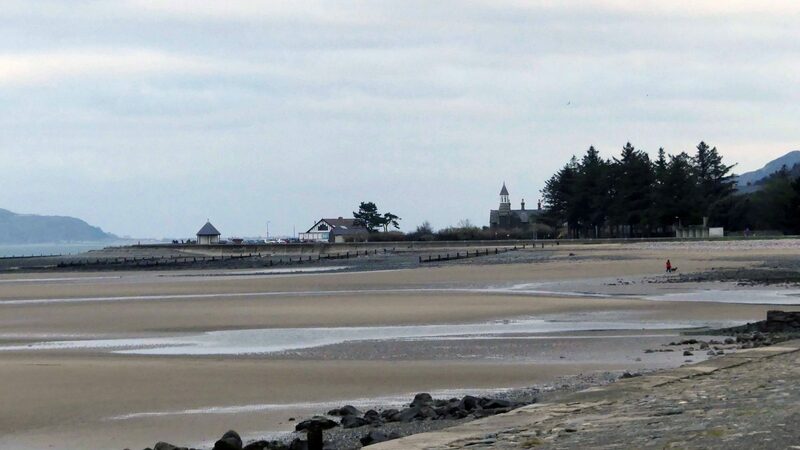 13:45 At the end of the Promenade I stopped again to take in the vastness of the view across the Menai Straits to the dark blue coastline of Anglesey. 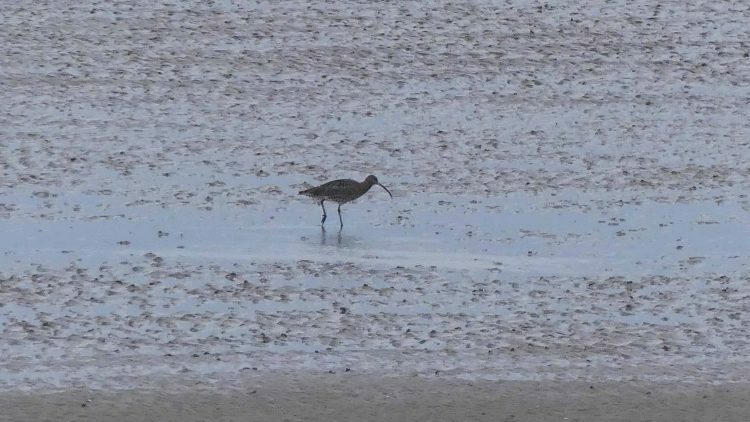 A lone Curlew stalking through shallow water seemed small and vulnerable out there on the expanse of sand, emphasising the bleakness of the day. 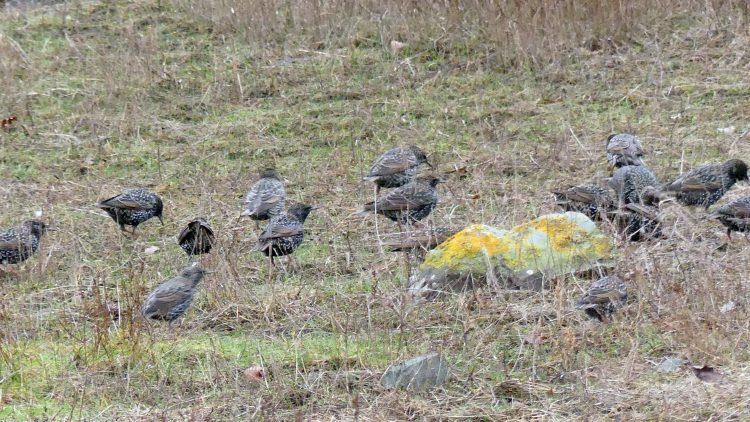 13:49 In the rough grass on the other side of the wire fence a small flock of lively Starlings were foraging and bickering amongst themselves as Starlings do. 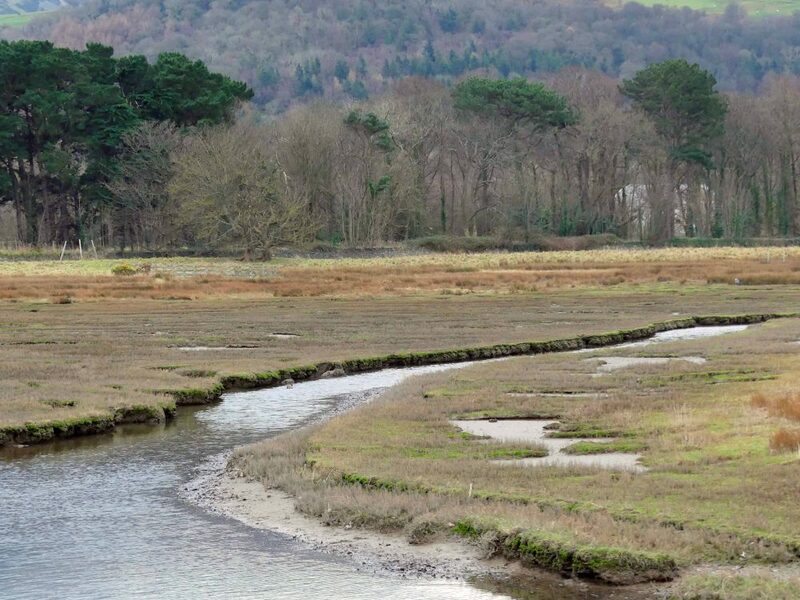 Apart from the cheery Starlings, my first impression was that the saltmarsh was peaceful – and empty! The great flocks of Wigeon that were here a month ago are gone. I guess they’d exhausted the available food supply here and that most of them will have moved inland to fresh pastures. I’m so glad I got to see them while they were here and with luck thought there may still be a few remaining here to see. 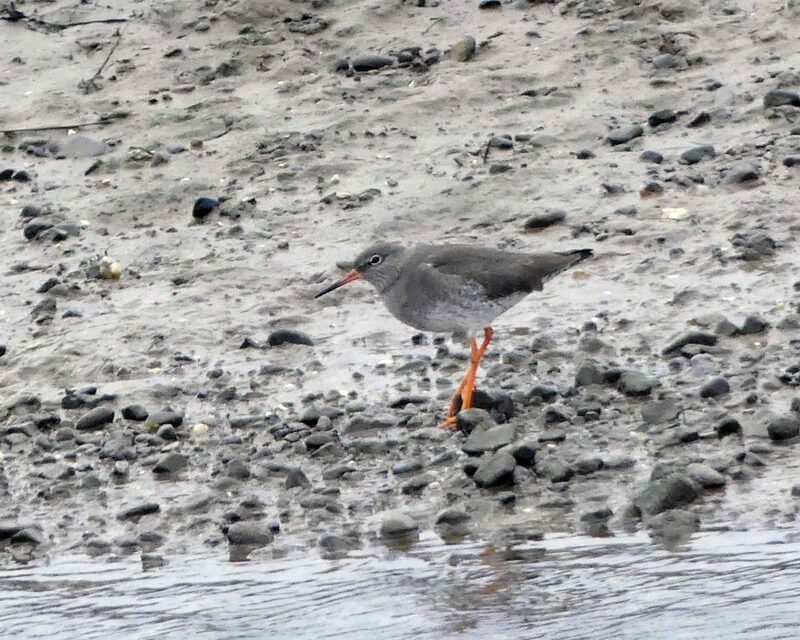 13:50 A Redshank, its bill half-covered with mud stood motionless nearby. It must be hard work for birds to find enough food to stay warm, let alone mobile on cold days like this. 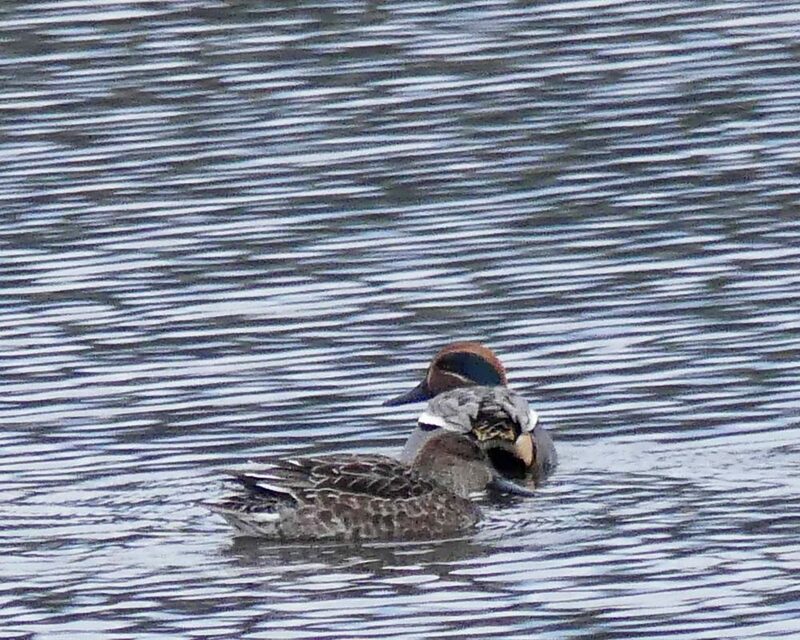 13:51 As I said, my target ducks for today were Teal and I was starting to think they too had gone along with the Wigeon; then I spotted a pair swimming together along a water-filled channel. Against the background of the textured water surface they were a pretty sight and may have made a pretty picture if the light had been kinder. But at least I’d seen some and there could be more out there sheltering from the weather. 13:52 Scanning along the channel for more ducks – I actually had binoculars with me today- I caught sight of a Grey Heron standing with its shoulders hunched up and its back turned to a stand of reeds. 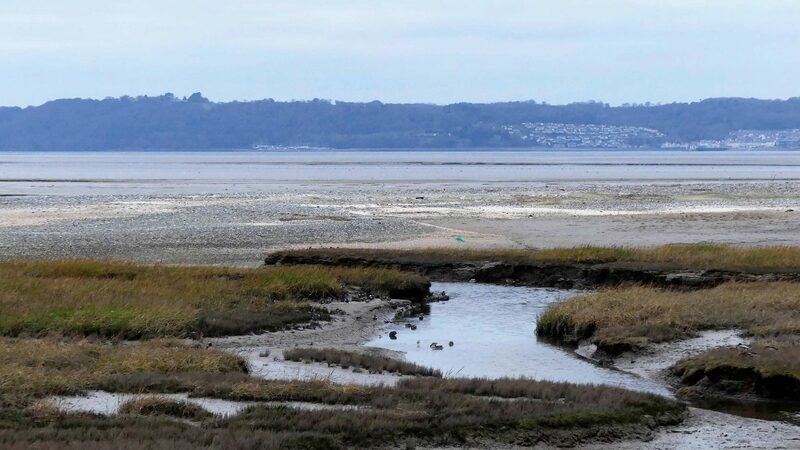 It was some distance away; in this picture showing the channel the Teal were swimming in, it’s the tiny grey dot on the right hand side, other side of the water just above centre and about an inch in! 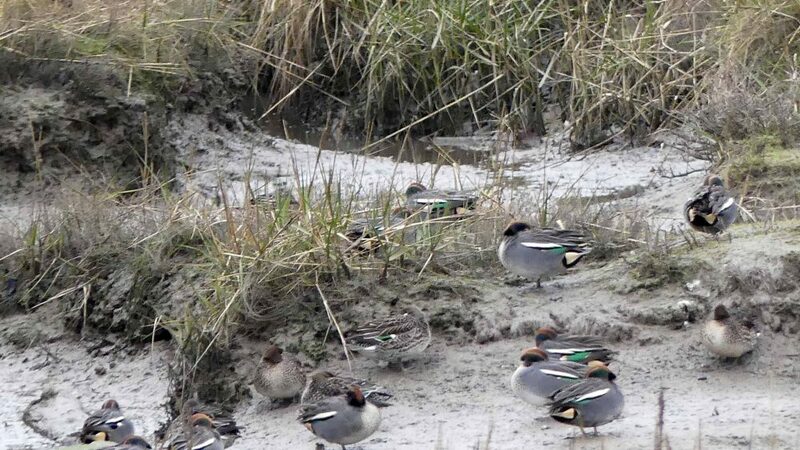 I was distracted by some frantic and noisy wing-flapping coming from the muddy bank nearer to me. 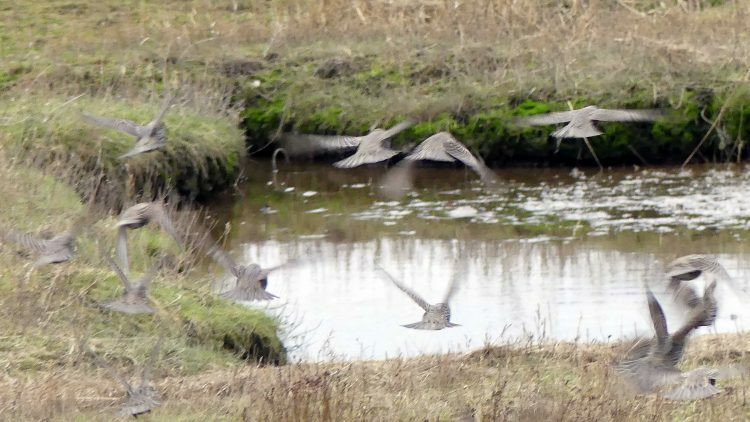 I felt a moment of dread, half-expecting to see a duck having been seized as prey by something, but it turned out to be Starlings who were dipping into the water and flapping themselves dry. I couldn’t help thinking they must be hardy little migrants from Russia or Scandinavia or somewhere similarly cold, that water must be icy. When the tide is out water drains back out of channels exposing the soft mud at the bottom. 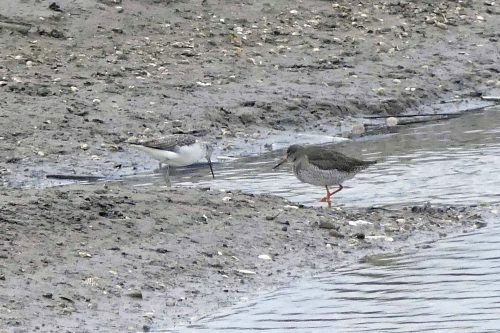 13:59 – Thus far I’d not had much luck seeing birds, so I was more than happy to see another Redshank foraging on the side of an empty channel. 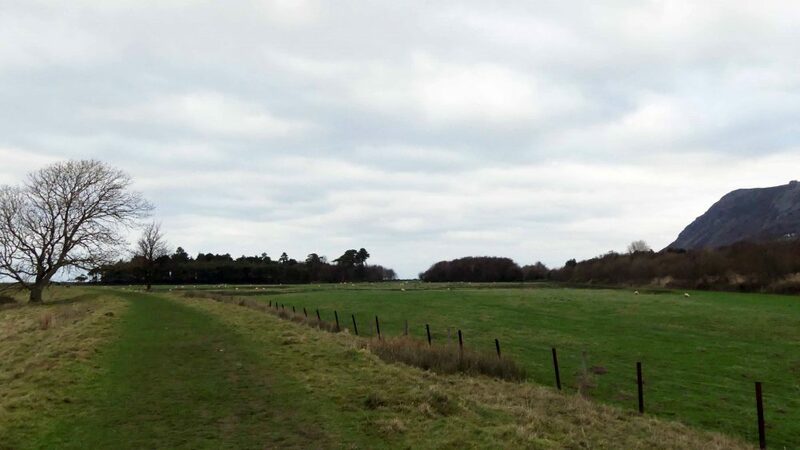 I’d rounded the bend in the track and was heading towards the Reserve boundary. The railway line runs through the middle of the photograph below and you can just make out the Expressway (A55) at the base of the mountain. 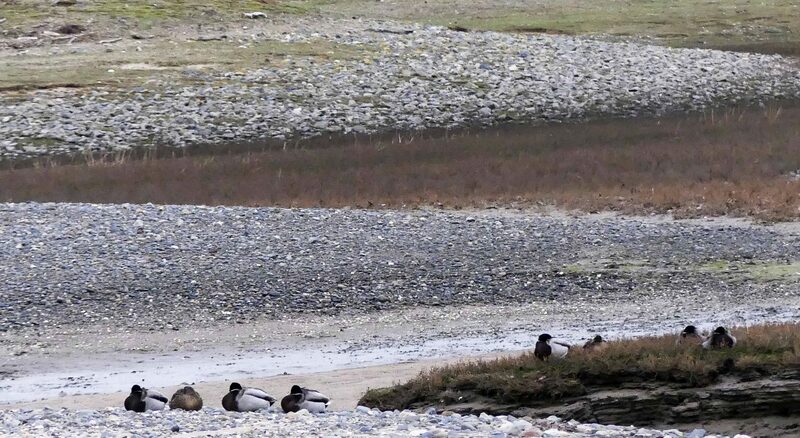 There were a few Mallards sitting on the edge of a muddy peninsular, more were sheltering below against the bank at the water’s edge. Three more were hunkered down on top of a gravelly bank with their backs to the wind. 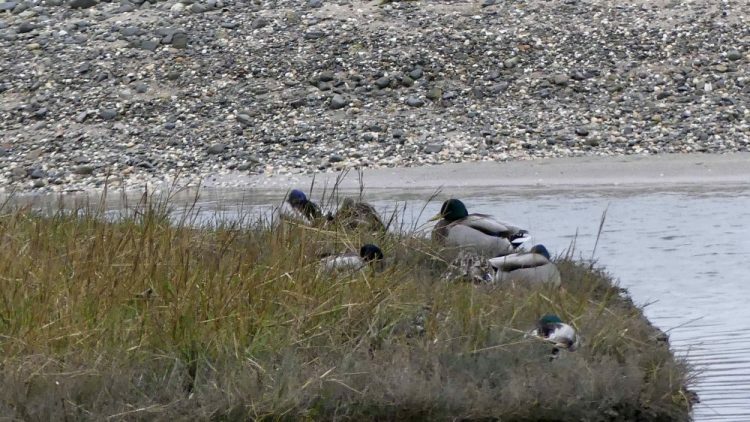 14:05 I’m happy to spot a pair of Teal resting on a muddy beach on the other side of the little peninsular where the Mallards sat. A bit further along, higher up the bank I found some more. The little flock was quite spread out, I counted about twenty that were visible, but there could well have been more nearby and further back. 14:08 A pair headed into the water, disturbing a bird already there that otherwise I may well not have seen. I thought for a minute that it may fly off before I’d had a chance to have a proper look, but it just gathered itself together and carried on stalking and scanning the shallow water for potential food. 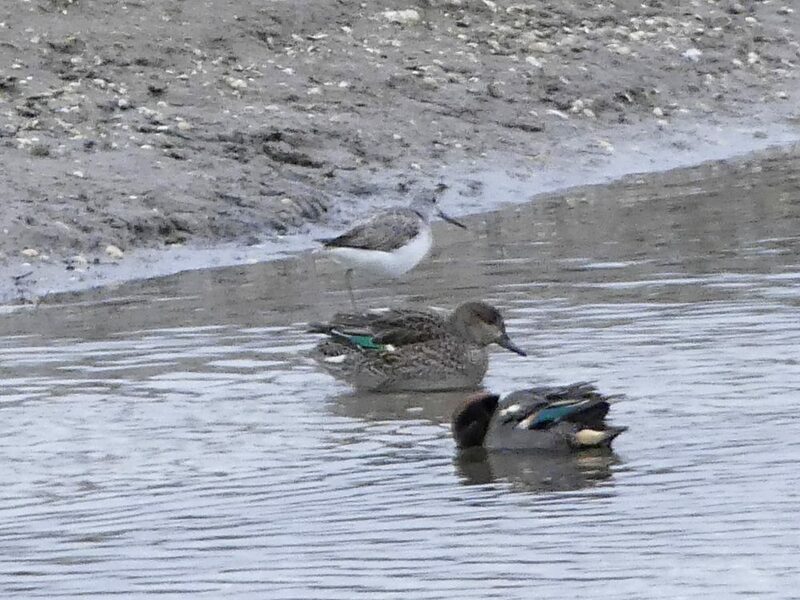 Apart from having been engaged by the Teal flock, it’s not surprising I hadn’t spotted the wading bird by myself. The light was dull, the water grey, the mud a greyish-brown and the bird merged into all perfectly. I wasn’t holding out much hope of getting any really good images, but my thinking is that when you’re looking at a bird you don’t immediately recognise, take as many shots as you can and chances are some will be good enough to at least confirm an identification and serve as a record. As it happened I’d worked out what I thought it was as I focussed in on it. 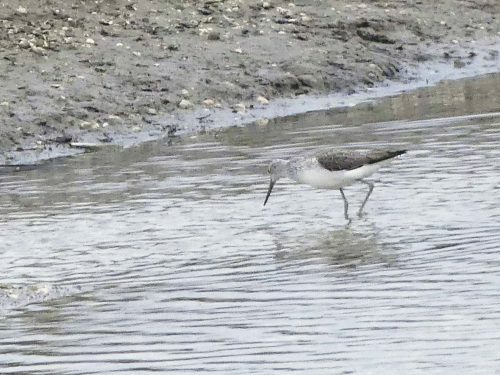 It must be a Greenshank, which are pictured on the information boards back at the beginning of the walk. 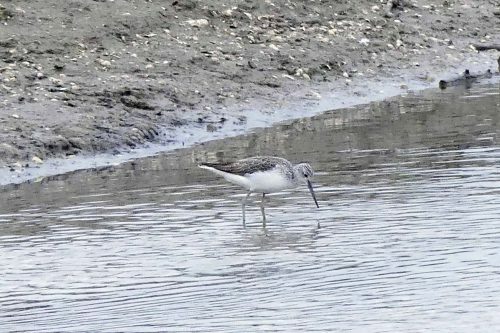 This was the closest view I’d ever had of one though, and the first I’ve been able to photograph, but certain features rang bells: an elegant wader; long, slightly upturned bill and long legs that are as its name implies green. Although they looked more grey to me in this light. 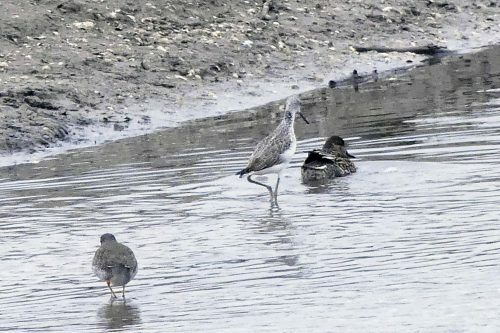 In the UK Greenshank breed on the wild moorlands of the Scottish Highlands and Islands. 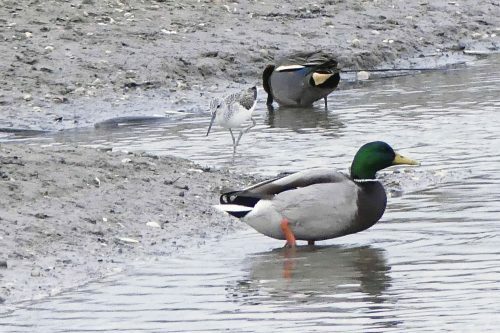 In late summer and autumn they move south on migration, stopping to feed in marsh pools, on estuaries and rather less scenically, on sewage farms and are widespread in the south. Only a few birds remain in Britain over winter, mainly on the Irish coasts, so maybe that’s where this one is heading for. It’s not far to Ireland from here. It’s yet another bird on the BTO’s AMBER list because of breeding numbers and winter range declines. It’s moments and sights like this that make the effort of going out on days so worth it! 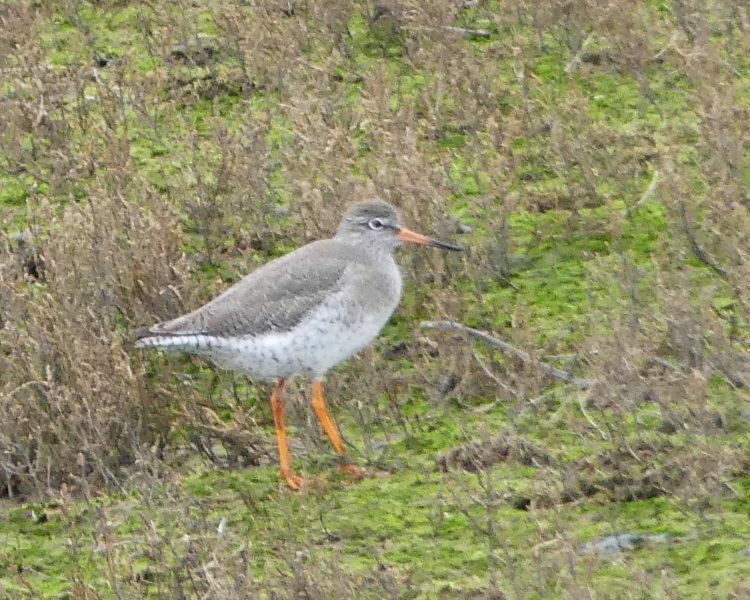 My favourite moment was when it was joined by a Redshank, which suddenly appeared from nowhere. I was so lucky to get the two related birds in the same shot. 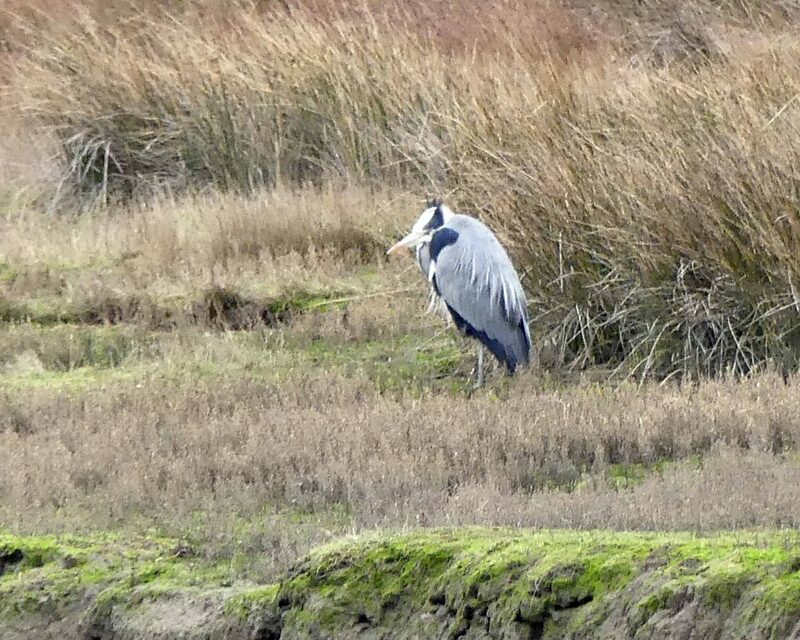 The bird carried on with its quest for food regardless of much bigger ducks entering the water nearby. I did wonder if they might be helping by stirring up the mud beneath the water and disturbing anything it may eat, like small fish or worms. 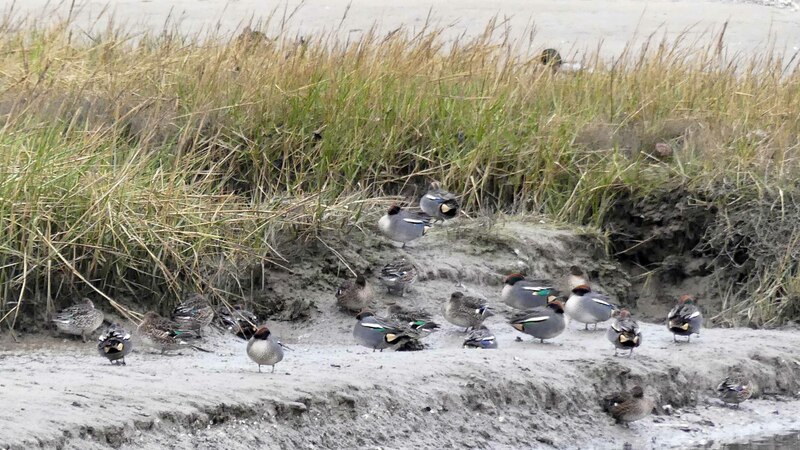 And to put the birds into scale and context within the landscape, this view shows the pool of water the birds were in, tiny specks just visible, and the adjacent bank where the Teal were roosting. 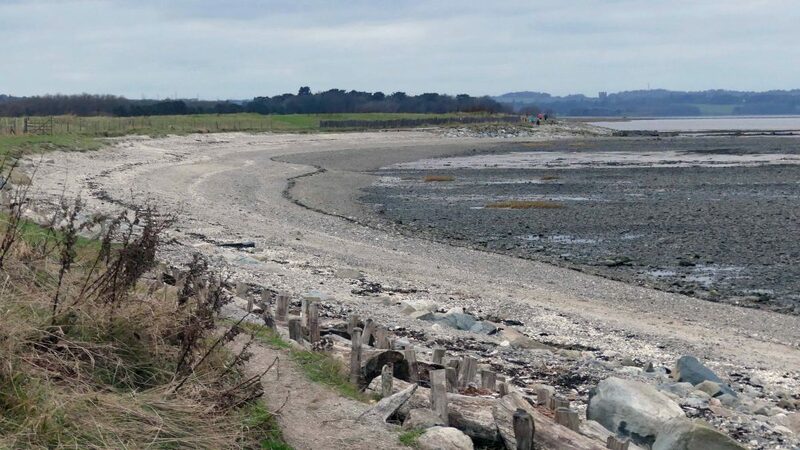 I carried on around the path to the other side of Shell Island and stopped just past the front of the bird hide of the Morfa Madryn Reserve. 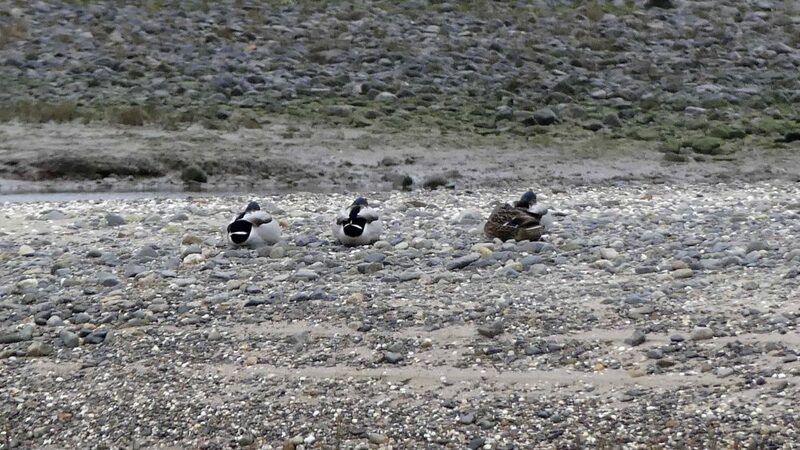 A few Mallards were resting in the rough grass and out on the gravelly sand; the pebbles may be hard but they’re mostly smooth and may have retained some warmth from the day’s scant sunshine. 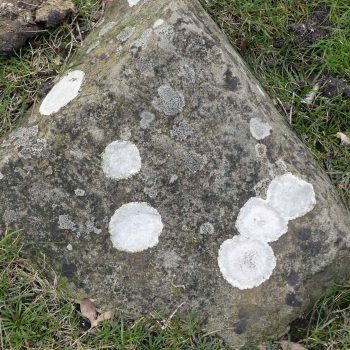 They gave me a focal point for the photograph too – I loved the zig-zag pattern and different shades and textures of the pebbles and grassy ground. 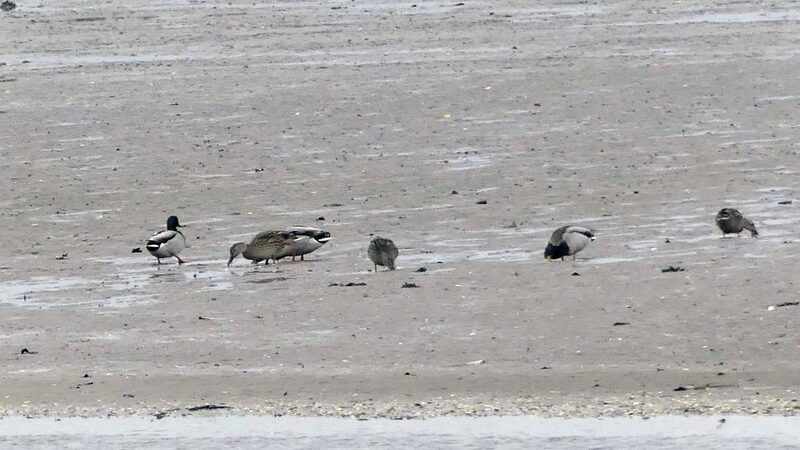 A few more were up and about foraging on the damp sand. 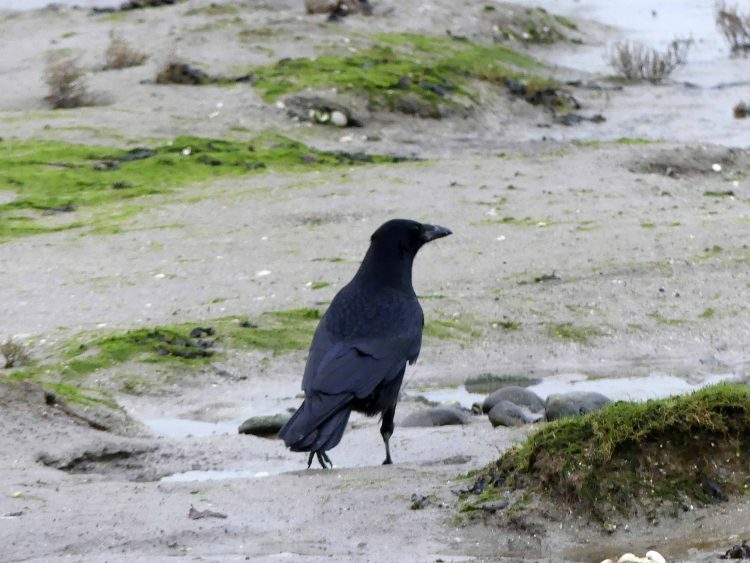 A Crow, that I’d hoped might have been a Raven, but wasn’t, was also hopefully patrolling the sand. Once again I contemplated carrying on along the Coast Path for a while, but no, it was way too cold and windy for me to derive any joy from that today. I took the more sheltered path back. 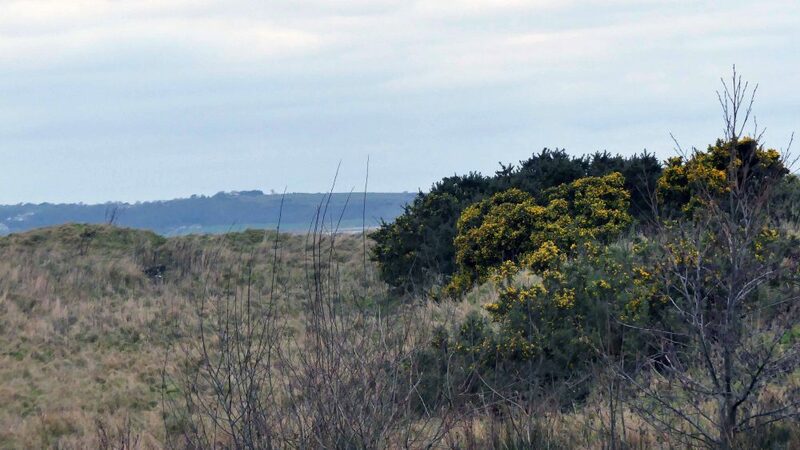 On the scrubland gorse is coming into full bloom now, bringing a welcome and cheering touch of gold to the landscape. 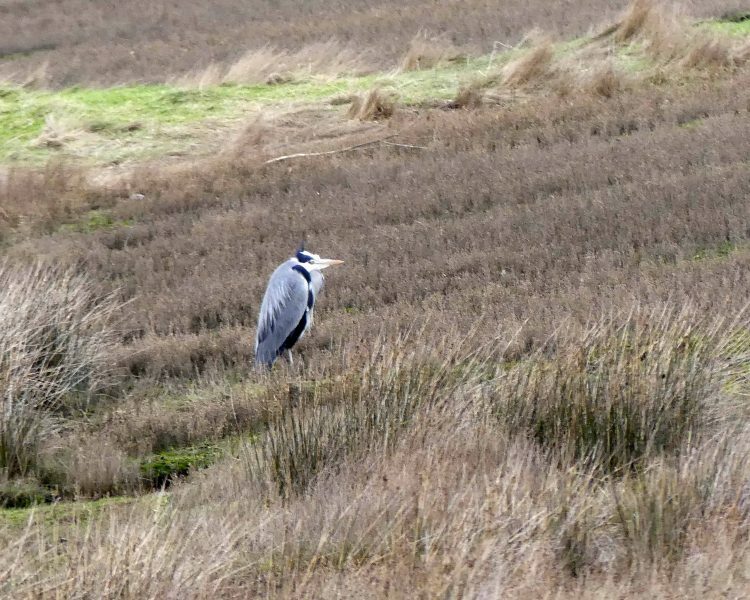 14:28 I had a closer view of the Heron walking this way. It was still in the exact same spot as before. It must have been sleeping. The path ahead of me was unusually deserted. 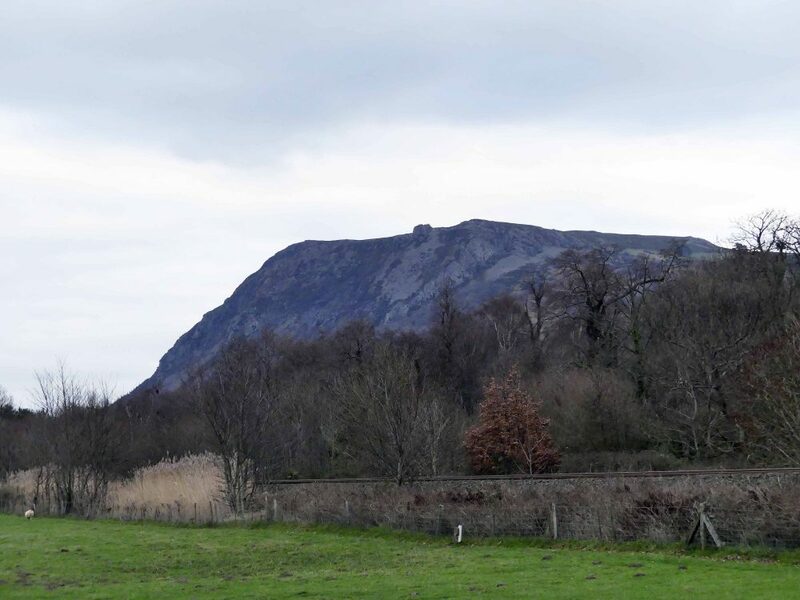 Beyond the railway line Penmaenmawr Mountain, looking big, bulky and brooding. 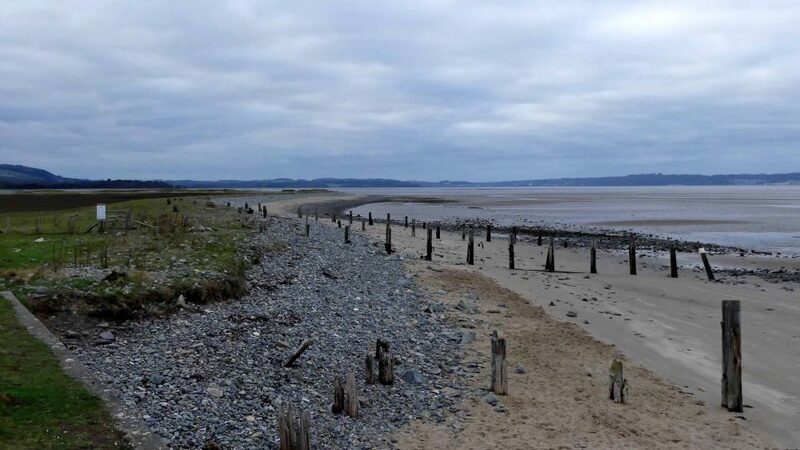 14:45 I love the view across the Traeth. All you can see is the Pavilion, the café building, the Tower House and a stand of dark pine trees. Promenade I see that there is only one person on the sands with a dog. At this time on a Saturday there would usually be a lot more. 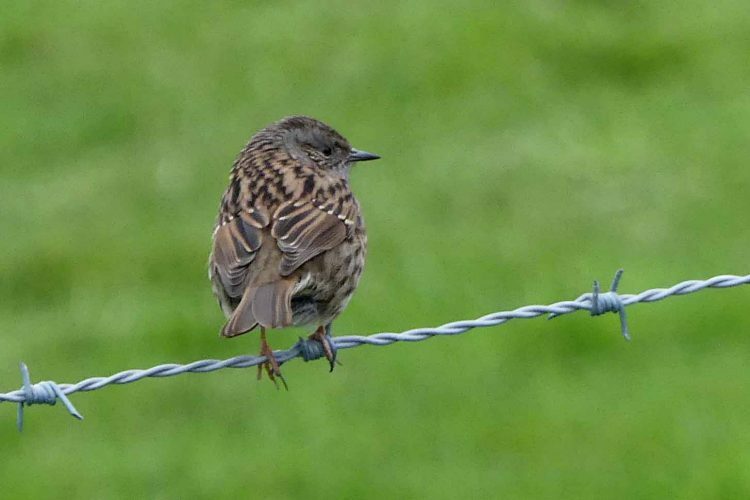 14:53 There were a few more birds to see on the way back; Oystercatchers, a Redshank, a Curlew and Black-headed Gulls out on the sand; and on the field side of the path a Chaffinch up in an ash tree and a Dunnock perched on the barbed wire fence. I didn’t linger to look again at the Swans and other collected ducks and birds that were now gathered on and around the lake. I did wish the café had been open though. 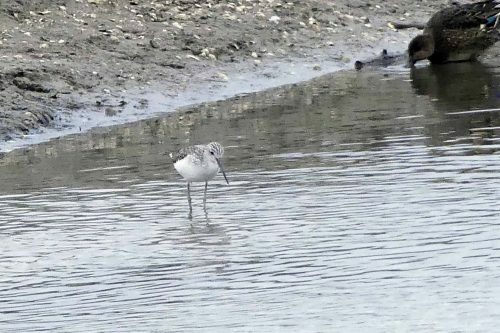 Not too many species today, but what was lacking in quantity was made up for with quality; the Greenshank was a real treat! Oh, and I logged about 7.300 steps.